As a leading global provider of CNC precision manufactured plastic parts, we have invested in the most advanced CNC milling machines and specialist CNC milling tools available, including multi-axis, high-speed, pallet loaders and large beds, renowned for their high precision, quality and accurate repeat-ability. Using these advanced milling machines and our extensive expertise, we produce some of the most complex, highest-quality plastic parts used in some of the most demanding industries such as medical, life sciences and biotech. Using our advanced and precision CNC Milling techniques, experience and expertise, we can produce complex one-off parts and prototype runs, through to high volume fabrication of unique precision plastic components. What Is CNC Plastic Milling? One of our many CNC milling machines in operation, producing intricate precision writing instrument components. CNC (Computer Numerical Control) milling is a type of CNC machining using a similar process to the operations performed by cutting and fixed drilling machines. Milling machines use a cylindrical rotating cutting tool and unlike traditional drilling they can move along multiple axes, allowing components to be made into many different shapes with slots, holes and other required features. Milling machines can produce many different shapes from virtually every type of plastic that would be nearly impossible to do using traditional manual tooling methods. 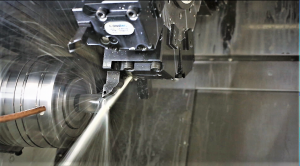 Most CNC milling machines also integrate a device for spraying fluid on to the cutting tool during operation to ensure the cutting tools are kept cool (as shown in Pic 1). CNC turning is an intricate engineering method of creating precise custom plastic parts and components. CNC Turning is based around the traditional lathe. Carville have a wide range of CNC turning machines including some of the most advanced that have the capability of producing the highest-quality smallest precision parts used in some of the worlds’ most demanding industries. In addition, We can produce complex one-off parts and prototype runs, through to high volume fabrication of unique precision plastic components. Using our CNC Milling or CNC Turning expertise, experience and techniques, we can produce complex one-off parts and prototype runs, through to high volume fabrication of unique precision components.